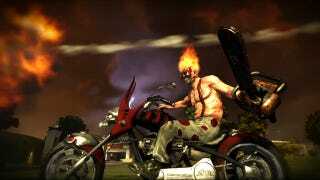 Video game creator David Jaffe says that his baby, the new Twisted Metal for PlayStation 3, is slipping to early 2012, missing its planned October release date. The vehicular combat game simply needs more time to be incredible, he explained on a post on the PlayStation blog today. "If we shipped Twisted Metal tomorrow-–going off the response from folks who have played it—I assure you, it would never be a bad game. Not even close. But we're aiming for a heck of a lot more than that! With Twisted Metal we plan to ship a multiplayer classic. We plan to ship the best Twisted Metal ever made. We plan to convert a lot of folks who think vehicle combat is a relic best left to 90′s nostalgia. And we plan to explode the belief that the only relevant kind of shooter is a first person one (or a 3rd person one, where you play a human… with a tee shirt not all the way tucked in …). "Most importantly, we plan on treating you – the kind folks who play our game (and pay our bills) – like the VIPs that you are. You only deserve our best and we appreciate your understanding as we take a little more time to guarantee that our best is what we deliver". We already like what we've played, but Jaffe's aiming admirably high with this game. It will be playable later this month for the press and public in Germany at Gamescom and in the U.S. at the Penny Arcade Expo. Twisted Metal was going to be one of the big PlayStation exclusives this fall. Fear not, PS3 fans, you'll have the still-on-track fall exclusives of Uncharted 3, Ratchet & Clank All 4 One and Resistance 3 to brag about.